Looking forward to breakfast with the structural toast problem solved. And????? Oh no, the one sided toast problem again. How can you get something right and then get get something wrong? This is what the Greek Economic Planners need to get their collective heads around. Imagine if Barak Obama shook someone’s hand properly, and then someone else’s hand like a limp fish. Wouldn’t make sense. A conversation with a young English couple revealed rising toast related anxieties as well. 10am. Time for bit of a sail around Santorini. Great day for it. Up to reception to wait for our transfer to the port. Into the vehicle, and off to the port. We speak to a couple of American girls from NYC and Boston on the way. A few questions about Australia. Yeah, its a pretty funky place with funky people and dysfunctional governments. 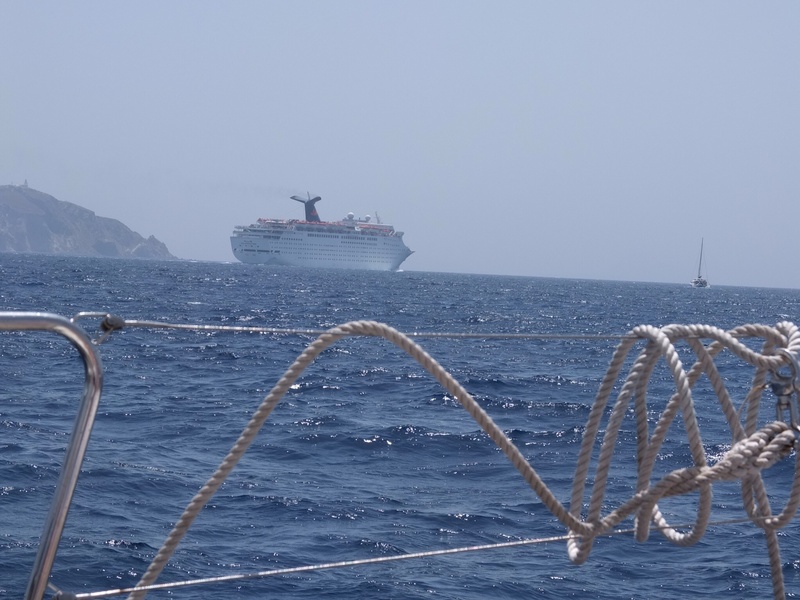 When we get to the port, its a sea of activity. The American girls take off to another yacht, we head to a yacht called the Atlantis. You mean I’ll be sailing on a yacht called Atlantis, over part of the mysterious Atlantis? How good is this? 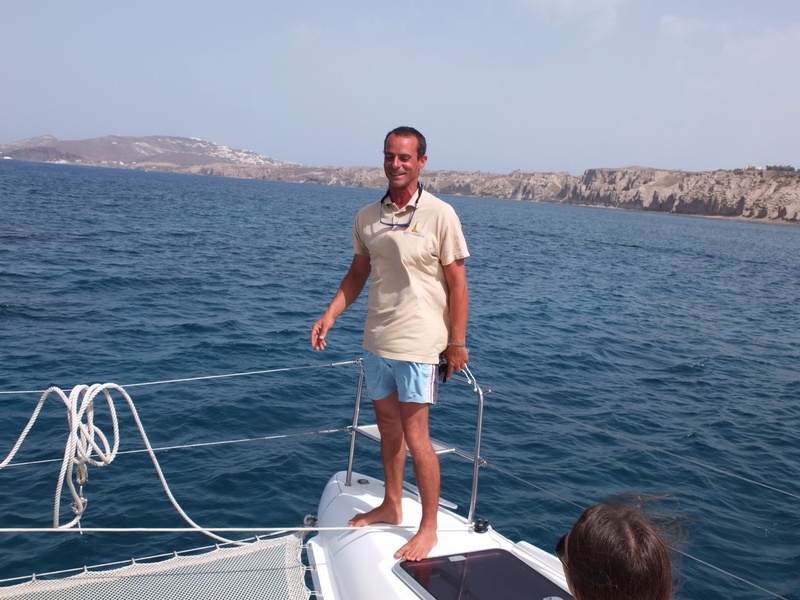 Captain Vladamir from Belgrade introduces himself, along with his two able assistants from Croatia, Bilianna and Tammy. A good looking Catamaran bobs around in the water. Lets see what this baby can do on the high seas. And we’re off. 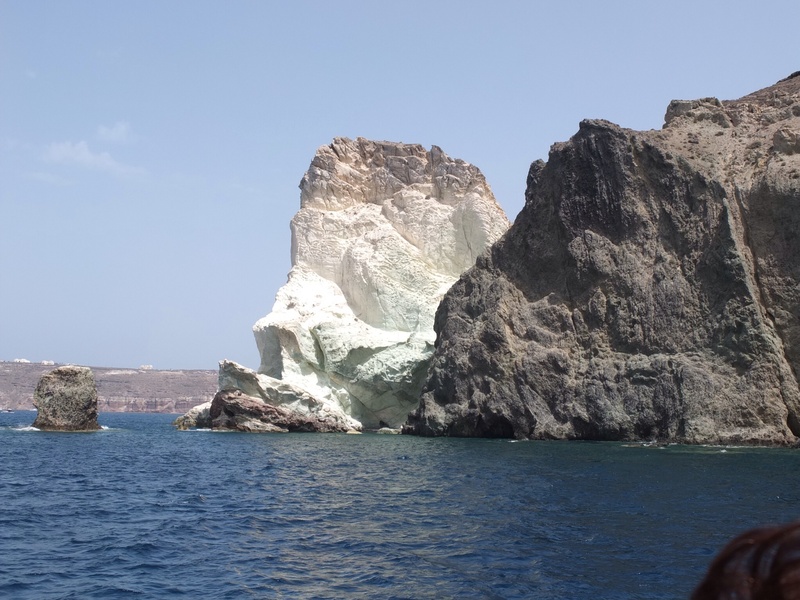 The plan is to cruise around the Santorini coastline stopping off for 15 min swim at the Red beach before pushing around the coastline, past the lighthouse and into the Caldera (the volcano). Yes, the volcano is under water. After a swim in the Aegean, we literally float onto the Caldera. We are over a volcano crater that was created 5000 years ago. The Tsunami that resulted from this epic event wiped out the civilisation that was on Santorini as well as the Minoans (?) as far away as Crete. Wow. We have another swim in waters that have a sulphur base and are volcanically warmed up, and then its time for lunch. As we are having lunch the boat music starts playing White Room by Cream. In actual fact, when we were in London on the Rock’n’ Roll Tour, we actually saw the building containing the White Room. A utopian moment. We chat to an American couple from the mid west. Gee they hate Obama. They don’t feel secure. The woman works as a lawyer specialising in litigation. How unusual, (not). Litigation is like a blood sport in the USA. After lunch its up with the anchor and up with the sails. We’re gonna sail back. Yeah, man. Great decision to do this little 4-5 hour cruise. A great way to see the island, from the water. Back to the port we say our goodbyes to people that we will never see again. This always seems to weird me out a little, although I do have the details of 2 couples that we could visit overseas at some point in the future. Back at headquarters, we opt for a quick swim. We then head back to or spot and check out BBC. We order in our dinner, and watch Obama’s statement about ISIS and Iraq. Mess. Last day tomorrow. As cruisey as possible. ~ by gazlington on June 20, 2014.